The title for this book makes a very bold claim indeed. What exactly constitutes "Proof of Extraterrestrial Intelligence"? On an individual, subjective level, this book lives up to its billing. The author encountered a number of extraterrestrial craft over a period of nine months in 1968. Many of the encounters were shared by friends, family and work colleagues. The witnesses were left in no doubt that they had seen flying objects that had originated from another planet. So for the witnesses this certainly does constitute 'proof of extraterrestrial intelligence'. Does the same notion apply for anyone picking up the book who is researching UFOs? The sightings are certainly significant. They occurred in the year of my birth in rural Florida. The area in question is near Bithlo, which is between Orlando and Cape Canaveral. This is important because the UFO activity appeared to be connected with activity at the Cape - notably a launch of a Minuteman Two rocket, and possibly the early Apollo program underway at that time. On that first incredible night in December 1967, two flying saucers (and this description of the craft is highly apt) appeared in the sky near to the residence of his brother-in-law, whom author was visiting at the time. They were well lit, were spinning and darting here and there. They then drifted down to the ground, apparently to land somewhere in the rural outback. Before long, the skies were subject to a search by military helicopters and jets. "The flashing red lights that circled the lone ship's outer perimeter moved faster and faster in the 6-5-4-3-2-1, 1-2-3-4-5-6 sequence as it climbed steadily above the dark terrain below. Then the ship shot straight up, paused, accelerated to a greater height until the celestial vessel's outer structure transformed into a glowing white magnificent craft. "The bright object shot straight up again, paused, hung in the dark starry sky. It then accelerated in one final ascending burst of speed, covering a vast distance. As I watched the radiant craft, now star-like in appearance as it hovered from its lofty position - the Eastern horizon exploded with a display of multi-brilliant colors. "Now, out of the myriad of colors, a fiery object thundered above the cold dark Atlantic Ocean. The Air Force had launched a Minuteman Two Missile from its underground silo at Cape Canaveral Air Force Station. "Then the bright craft zipped to the right, zipped to the left, performed a vertical Z-pattern all in one continuous flowing streak of light, against a background alive with a myriad of shimmering, stars (sic). This incredible encounter sparked off a near-obsessive interest in the skies above Florida for the author over the coming months. It's easy to see why. He and his relative had witnessed UFOs that hid from the U.S. military, and he then saw one of the craft buzz a missile launch. What's even more remarkable is that thereafter Jim Oglesby's nightly vigils on his porch, and at vantage points along the roads around his area, were rewarded by a succession of bizarre and notable encounters with UFOs. Often people would accompany him on his sky-watches, and would be shocked to realise that he had been telling the truth about his nocturnal encounters. The activity he watched that first night is in keeping with many other UFO incidents involving missile silos and launches down the years. These have been documented in 'UFOs and Nukes' by Robert Hastings. The contents of "Proof of Extraterrestrial Intelligence" would sit will within this wider dossier, and I think would then constitute something approaching proof of alien visitation to our planet. What is striking is that the visits have a purpose - close surveillance of our missile and nuclear activity. But James Oglesby's account goes a step beyond even this. There is a multiple-witness observation of a hidden UFO with what looked like a government automobile, leading us to the conclusion that each side was watching the other, and that some kind of clandestine meeting may have taken place. His own continuing fascination with UFO activity in his area appeared to attract the attention of the UFO occupants themselves. There was a concerted effort to draw him close to their landed vehicle on a couple of occasion. For obvious reasons, Jim bottled it and ran for his life! But in doing so, he realised that he had lost the opportunity to meet with aliens from another world. This led to his interest in UFO lore, particularly books by the controversial contactee George Adamski. There are similarities between the two men's accounts, and James Oglesby quotes Adamski and his associate C.A. Honey (who I had the pleasure of corresponding with for many years). This slots 'Proof of Extraterrestrial Intelligence' into the Contactee camp in Ufology, of which Tim Good is an advocate, and it is unsurprising therefore to see Tim's recommendation on the back cover. But it is worth bearing in mind that James Oglesby never actually saw or met the inhabitants of the flying saucers he encountered, so we cannot know for sure if they were the 'Nordic' types, or Greys. It's always difficult to decide whether a book like this would be better written by a UFO researcher (like Tim Good himself) or by the witness. There is a balance between the integrity of a first hand account and the obvious drawbacks of the author not being a professional writer. The book could have been put together in a better way. It jumps about a lot, despite giving the basic structure of a chronologically-ordered account. It's sometimes difficult to remember which particular encounter the author is referencing in the text, for instance. Also, the descriptions of the area and road network are detailed, yet I never get a good mental picture of it. I feel the need to get onto Google Earth to visualise the map in my mind, although the detail given to that rural location by Google is unlikely to be sufficient. The location is seen in the image to the right, with thanks to the author. I do think that Mr Good could have made a better job of the book, given the chance, and he would have brought a mainstream publisher to the table too, giving the book a greater prominence. But saying all that, the substance of the book is what it is all about, and that shines through. James Oglesby kept a journal of all his encounters, and used this to build up this chronicle, despite the passing of 40 years. He writes as if it happened the night before, with the same excitement and awe. That is hard to put across in the third person, and it lends the book considerable merit. There is also a psychological dimension to this book. The effect upon the witness is evidently profound. His behaviour changes as a result of his encounters. This has an effect on the people in his life too, and this provides further support for the veracity of the sightings. The author draws conclusions about the activity he has witnessed that a researcher might avoid, and these insights are personal and important. The behaviour of the objects is intelligently driven - they are not simply lights in the sky - and James Oglesby's interpretations of that intelligently-driven behaviour is of critical importance: He surmises intent. I enjoyed reading this book, and would recommend it to anyone interested in the UFO phenomenon. 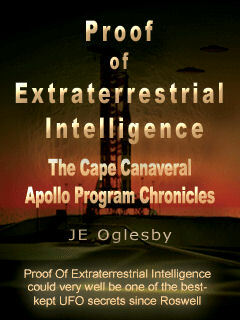 Subtitled "The Cape Canaveral Apollo Program Chronicles"